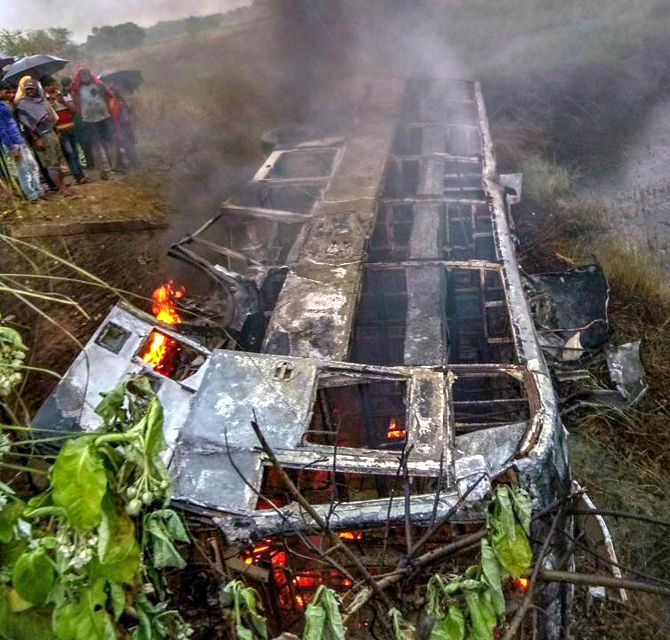 At least 20 people on board a Delhi-bound bus were feared dead when the vehicle skidded off a highway in Bihar's East Champaran district, fell into a deep pit and caught fire. The incident took place around 5 pm on NH-28 near Belwa village under Kotwa police station area, about 30 kilometres from Motihari, the district headquarters. The private air-conditioned bus had begun its journey at Muzaffarpur, about 85 km from Motihari. The fire incinerated the bus and nobody could be retrieved so far. According to Deputy Superintendent of Police (Sadar) Murli Manohar Manjhi, altogether 11 people were undergoing treatment at hospitals for injuries sustained in the incident. He said some of the survivors had managed to come out of the bus by smashing the windows while others were rescued by locals. They are being treated for injuries at a hospital, the officials, who were supervising rescue work at the spot, said. State minister for disaster management Dinesh Chandra Yadav had expressed apprehension that more than 20 people could have been killed in the incident. However, some of the surviving passengers told regional news channels that "only 13 passengers, besides the driver and a helper", were inside the vehicle when the incident took place. They said a total of 32 passengers had booked their seats in the private bus, out of whom only 13 had boarded at Muzaffarpur and the remaining were likely to catch the vehicle at Gopalganj. Chief Minister Nitish Kumar expressed grief over the incident and observed a minute's silence as the news reached him in Patna at a function organised to launch various schemes of the transport department. Kumar said that he was "pained by the irony" that the news of the incident was received by him at a function held by the department concerned with road safety. Kumar was also quoted in an official release as having ordered expeditious payment of ex-gratia to the next of kin of the deceased and proper treatment of the injured. However, the number of persons killed in the incident remained shrouded in mystery with officials at the spot claiming they found nothing to suggest that any person was trapped inside the bus when it went up in flames. State minister for disaster management Dinesh Chandra Yadav had said earlier in the day that the bus was carrying 32 passengers and more than 20 persons could have been killed. Deputy Chief Minister Sushil Kumar Modi tweeted: "Very saddened by news of bus accident in Champaran in Bihar. Casualty may go up to 24 or more." However, Manjhi, as also East Champaran SP Upendra Kumar Sharma said not a single body was recovered from the spot and that while the bus was engulfed in flames, there was no smell of charred flesh. Principal Secretary, Disaster Management, Pratyay Amrit said the heap of metal would be cut through with special equipment after which there would be more clarity if any person remained trapped inside. Some of the survivors, however, told regional news channels that altogether 32 people had booked their seats in the bus online, out of whom only 13, besides the driver and a helper, had boarded the bus at Muzaffarpur. More passengers were expected to board at Gopalganj where the bus was heading to, when it overturned after the driver took a sharp turn to avoid colliding with a motorcycle, they said.